SAN SALVADOR, El Salvador (AP) -- Latin American leaders are urging the United States to repeal its 47-year-old trade embargo against Cuba. The leaders say the "unilateral" embargo is unacceptable and harms the Cuban people. The leaders made the statement on Friday, the final day of the IberoAmerican Summit in El Salvador. The move came after the U.N. General Assembly on Wednesday asked the U.S. for the 17th year in a row to lift the embargo. The U.S. has no diplomatic relations with Cuba and lists the country as a state sponsor of terror. The embargo, imposed in 1962, has been tightened during President Bush's two terms. America's economic sanctions on Cuba, now 50 years old, are a failure. Among New York's rites of autumn -- the marathon, the rainbow of leaves in Central Park, the sudden profusion of wool overcoats -- a new one has emerged at the United Nations. In each of the last 16 years, the General Assembly has voted to condemn the United States for its embargo of Cuba. This year's ceremonial vote takes place today, and if it's anything like last year’s, it will be overwhelming. Only Israel, the Marshall Islands and Palau stood with the U.S. in the 184-4 tally last October. Washington doesn't and shouldn't design its laws around U.N. opinion, but it's instructive to learnwhat even this country's closest allies think of the Cuban embargo. Colombia, one of only a handful of Latin American countries whose government remains firmly pro-U.S., stated in a U.N. report on the issue that it "thinks this kind of action should stop and that member states should move ahead with building relations of friendship." In the same report, the European Union said that it and its member nations "have been clearly expressing their opposition to the extraterritorial extension of the United States embargo." More astonishing than our willingness to raise the ire of nearly the entire world with our embargo is that it has survived this long in the face of overwhelming evidence of its failure. For 50 years, this country has been trying to produce regime change on the island by strangling it economically. Last we checked, a Castro was still in power, and even the economic devastation wrought by the two worst hurricanes in Cuba's history weren't spurring mass popular uprisings. U.S. sanctions worsen poverty and its attendant ills but only strengthen the Castro regime, which can blame all of the country's problems on Washington rather than addressing their true cause -- Havana's misguided economic policies. The presidential election offers a rare opportunity for change. John McCain favors business as usual with Cuba, but Barack Obama believes that Cuban Americans should have unrestricted rights to travel to the island and send remittances. It is absurdly contradictory to allow Americans to travel freely to Iran and Venezuela, which are genuine security and economic threats, but not to Cuba, which poses no threat at all. U.S. ideals would be more influential if Cubans were more frequently exposed to them by American visitors; our interference with remittances, meanwhile, hurts only the poor. Cuba is an anti-democratic country with little respect for human rights, and its leaders must be held to account. But targeted sanctions that punish the regime without punishing the people would be far more effective than the blunt instrument of an embargo. Obama's proposals don't go far enough, but they're a good start. The EU and Cuba have formally restored ties, five years after the EU imposed diplomatic sanctions on the island following mass arrests of dissidents. 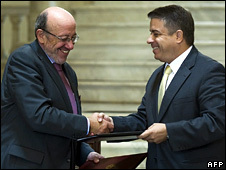 European Commissioner Louis Michel said the accord he signed with Cuban Foreign Minister Felipe Perez Roque was "a turning point for EU-Cuban relations". Mr Perez Roque welcomed its respect for the island's political independence. It will now receive 2m euros ($2.6m) of emergency hurricane recovery aid, with 30m euros ($38.9m) available next year. An EU delegation will return to Cuba in November to determine the needs and priorities for the financing to be made available in 2009. The two recent hurricanes which swept through Cuba in late August and early September - Ike and Gustav - caused billions of dollars worth of damage. Yet Cuba's communist authorities refused all offers of aid not just from the US but the EU as well - a sign of just how strained relations had become. Now following a signing ceremony in Havana, Cuba and the EU have agreed to resume co-operation. A joint declaration, signed by Cuba's foreign minister and the European commissioner for development and humanitarian aid, calls for respect for Cuba's political independence and non-intervention in its internal affairs. However, according to Mr Michel, the Cuban government has agreed to resume political dialogue in which "no subjects will be taboo". This should open the way for future talks on issues such as democracy, human rights and political prisoners. Mr Michel also announced an aid package of up to 30m euros for hurricane reconstruction. How to deal with Cuba is one area where Europe and the United States have substantial differences. Since Raul Castro took over the presidency, following his brother Fidel's retirement due to ill health, EU policy has been to try to develop a dialogue with Cuba in the hope of influencing change. But the Cubans demanded that the EU formally lift the diplomatic sanctions which it imposed in 2003, following the mass arrest of dissidents. The sanctions were suspended in 2005, but only eliminated altogether at the EU summit in June. Friends and foes have called Cuba many things - a progressive beacon, a quixotic underdog, an oppressive tyranny - but no one has called it lucky, until now . Mother nature, it emerged this week, appears to have blessed the island with enough oil reserves to vault it into the ranks of energy powers. The government announced there may be more than 20bn barrels of recoverable oil in offshore fields in Cuba's share of the Gulf of Mexico, more than twice the previous estimate. If confirmed, it puts Cuba's reserves on par with those of the US and into the world's top 20. 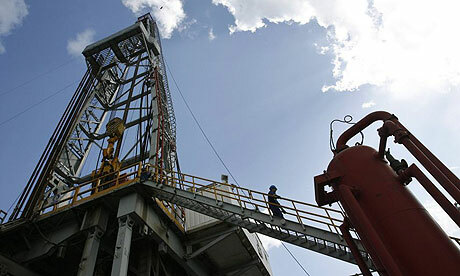 Drilling is expected to start next year by Cuba's state oil company Cubapetroleo, or Cupet. "It would change their whole equation. The government would have more money and no longer be dependent on foreign oil," said Kirby Jones, founder of the Washington-based US-Cuba Trade Association. "It could join the club of oil exporting nations." "We have more data. I'm almost certain that if they ask for all the data we have, (their estimate) is going to grow considerably," said Cupet's exploration manager, Rafael Tenreyro Perez. Havana based its dramatically higher estimate mainly on comparisons with oil output from similar geological structures off the coasts of Mexico and the US. Cuba's undersea geology was "very similar" to Mexico's giant Cantarell oil field in the Bay of Campeche, said Tenreyro. A consortium of companies led by Spain's Repsol had tested wells and were expected to begin drilling the first production well in mid-2009, and possibly several more later in the year, he said. Cuba currently produces about 60,000 barrels of oil daily, covering almost half of its needs, and imports the rest from Venezuela in return for Cuban doctors and sports instructors. Even that barter system puts a strain on an impoverished economy in which Cubans earn an average monthly salary of $20. Subsidised grocery staples, health care and education help make ends meet but an old joke - that the three biggest failings of the revolution are breakfast, lunch and dinner - still does the rounds. Last month hardships were compounded by tropical storms that shredded crops and devastated coastal towns. "This news about the oil reserves could not have come at a better time for the regime," said Jonathan Benjamin-Alvarado, a Cuba energy specialist at the University of Nebraska. However there is little prospect of Cuba becoming a communist version of Kuwait. Its oil is more than a mile deep under the ocean and difficult and expensive to extract. The four-decade-old US economic embargo prevents several of Cuba's potential oil partners - notably Brazil, Norway and Spain - from using valuable first-generation technology. "You're looking at three to five years minimum before any meaningful returns," said Benjamin-Alvarado. Even so, Cuba is a master at stretching resources. President Raul Castro, who took over from brother Fidel, has promised to deliver improvements to daily life to shore up the legitimacy of the revolution as it approaches its 50th anniversary. Cuba's unexpected arrival into the big oil league could increase pressure on the next administration to loosen the embargo to let US oil companies participate in the bonanza and reduce US dependency on the middle east, said Jones. "Up until now the embargo did not really impact on us in a substantive, strategic way. Oil is different. It's something we need and want." Now that Fidel Castro is no longer officially in power in Cuba, 60% of likely voters believe the U.S. should revise its policies toward Cuba – even more believe all U.S. citizens should be allowed to travel to Cuba (68%) and that U.S. companies should be allowed to trade with Cuba (62%). In a Zogby Interactive survey conducted in July 2007, slightly more than half (56%) of Americans said the U.S. should remove travel restrictions and end the embargo on trade to Cuba. More Obama supporters favored revising US policies toward Cuba (84%) than McCain supporters (35%). Forty-seven percent of McCain supporters thought all US citizens should be allowed to travel to Cuba, and 40% thought US companies should be allowed to trade with Cuba. For content, contact: James Bosworth at Inter-American Dialogue at jbosworth@thedialogue.org or 202-463-2565. For methodology, contact: Zogby International Communications Director Fritz Wenzel at 315-624-0200 ext. 229 or 419-205-0287 or fritz@zogby.com. Hurricanes offer opening to lift ineffective ban on trade, travel. 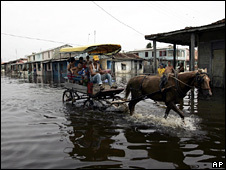 Before Hurricanes Gustav and Ike barreled into the USA, they devastated much of Cuba. With about half a million homes destroyed or damaged, many Cubans are in dire need of help. Food shortages are expected to get worse, as the double whammy wiped out a third of the island's crops. A U.S. rush to the rescue? Not exactly, but the storms have at least produced a small break from the counterproductive U.S. isolation of Cuba. For the first time since the United States imposed a draconian trade embargo 47 years ago, it offered $5 million in direct aid and allowed $8 million in private aid donations. U.S. officials described the moves as unprecedented. Predictably, though, the Castro regime said no. (Dictator Fidel Castro has stepped aside because of illness, leaving his brother Raul in charge.) "Our country cannot accept a donation from the government that blockades us," Fidel Castro, who remains a domineering presence, wrote in the communist party's daily newspaper. That's typical. Castro has long blamed the United States for all of Cuba's woes, using the embargo as Exhibit A. The tactic still works in Cuba, but support for the embargo appears to be shrinking here. As the decades of embargo have worn on, and new generations have been born, opinion polls have found Cuban Americans increasing split on the embargo. Despite the conventional wisdom that it's political suicide in Florida to oppose the embargo, many younger Cuban Americans are less keen than their elders to press for restrictions — and to vote against a candidate who wants to lift them. U.S. public opinion more broadly is in favor of lifting the embargo. One idea that has been put forward is to abolish restrictions that prevent Cuban-Americans from sending more than $300 every three months to immediate family members or making more than one trip every three years. That makes so much sense that even some hard-line Cuban American groups, normally cheerleaders for new restrictions, are for it. It has long been plain that the embargo has utterly failed in its original purpose of removing Fidel Castro. As important, the United States is hurting itself. The continued embargo is driving Cuba into the arms of anti-American regimes that are more likely to bolster, not end, the island's dictatorial tendencies. Russia, for example, has sent plane loads of aid. Venezuela has been helping prop up the Cuban economy with cheap oil. Many U.S. farmers say they have been hurt by the restriction. Lifting it could help stem a potential new tide of refugees fleeing to the USA if the hurricane devastation drives them to try the dangerous crossing. Rather than stick to outdated political games, the United States should deprive the Cuban regime of its scapegoat and lift the embargo. Castro's attempts to hold the United States responsible for his country's woes could then be exposed for what they are: an attempt to shift blame. And millions of Cubans can both be helped and start seeing a different truth from the Castro brothers' insistence that the U.S. is the author of all that goes wrong in Cuba.